Typhoon, as we all know, brings huge damages to human life and property. It could be considered as one of the worst natural disasters in the world, meanwhile, contains a huge energy which could even raze a whole city to the ground. As nowadays the deterioration of our living environment, we have all reasons to assume that, like most cases of extreme weather, the strike of the typhoon will become increasingly frequent. And Taipei, by its special location where the typhoon shows its horrible power most thoroughly, is regarded as a typical district in our research and design. Our design consists of two main correlated parts. The main building serves as a view frame of city landscape, inside which we arrange a variety of functions, including water retaining, storage, temporary shelter, research institution, and exhibition. Between the frames is a three-dimensional staggered space structure for holding numbers of devices for energy collection and typhoon intervention. Driven by the strong winds, these devices will float diffusely among a larger scale, converting and collecting the kinetic energy from winds to mechanical energy, electrical energy or thermal energy. They will also release chemical substances later in the air, including dry ice and other catalysts, for dropping the temperature and dehumidify the surrounding high moisture air. After the mission is done, another building, whose location should be chosen by probability calculation result, will capture all devices again. With both preventing and defending approaches, we see this project as an attempt for human positive intervening measures towards future disasters. If we see typhoons from another aspect, we will realize that they are more than a natural catastrophe. Despite that damage to the coastal cities, the consequent benefits we can get from the typhoon are obvious too, such as the enormous energy which would be 200 times larger than the worldwide output. If we could cut down the damage caused by typhoon and get use of this energy, we might be able to see typhoons as a natural fortune rather than a disaster. A city which is almost entirely built by private Industry. But when you look at the city closely it’s a city which is a direct result of the hyper capitalist consumerist economy. It has a private metro line, fire bridged, energy system and even security forces. As much as this has facilitated the growth of the city it has resulted into some strange happenings in the city. According to the Belgian philosopher, Lieven de Cauter, we experience our civilization only in capsular states. 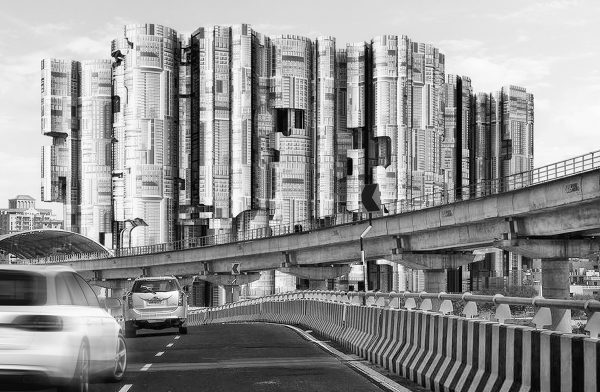 Based on this hypothesis, Gurgaon NOW asks what consequences such encapsulation – what Peter Sloterdijk identifies as spheres or foam formation, could have on our urban condition. The question is pursued through the architectural program of a city of call centers – that is, could serve as a model and organizational prototype for a city and the constant expansion of urbanization? 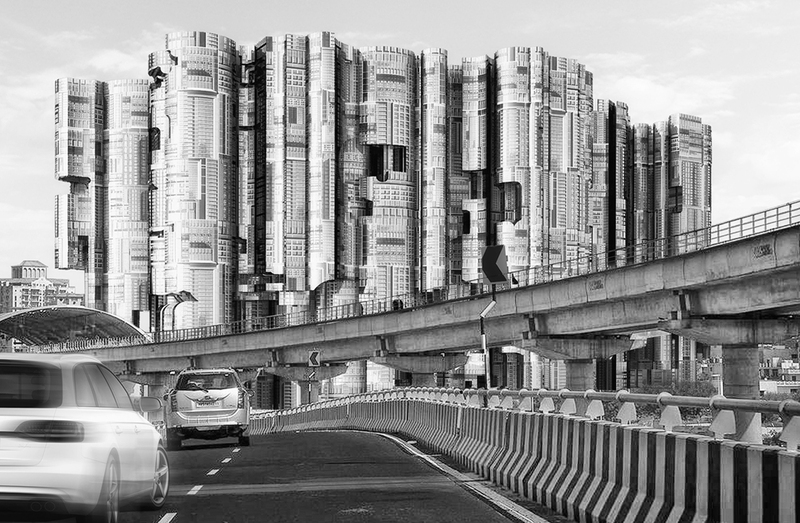 The design tasks contextualize the Gurgaon as a prototype relative to the existing growing cities in developing countries. The result of the design process is a strange city building whose formal principle derives from the misfit between other, different buildings and whose form is at once familiar and strange. New York is a multicultural city where many beliefs and religions coexist. Death gives rise to various dispositions, as evidenced by the many cemeteries in the city. Religion has an evolving character. We assume that in the near future we will see a standardization of practices, beliefs, where attachment to the body will become non-existent. This sends to question the future of the cemetery. At present, in view of the increase of the population, verticalization appears as a solution against the shortage of urban spaces. The cemetery establishes itself by digging in the basement spaces proportional to the different religions, while making the case of the current problems. Then, the more it springs, the more the present spaces will detach themselves from the basic uses of the cemetery. It will become confused with the sky and then disappear : the cemetery has no place to be. This vertical edifice represents the image of the evolution of manners with respect to death, body and spirit. The building itself detaches from its envelope. It is like the allegory of the progressive detachment of man from the body. In the den of the cemetery there is a generator of magnetic waves and a reserve for the retransmission of energies. While being light, This system propels the platforms and makes them move horizontally and vertically. This technique offers greater freedom in the design of the building. Challenging the systems of known distributions, this, offers a new way of apprehending spaces. By genera- ting a code, platforms are able to levitate from point A to point B. This means that the user has the possibility to choose the type of space he wants according to his needs As well as the route or the stops he wants to carry out within the building itself. It is the cemetery that modulates around the man, who’s static, remaining a prey to his mourning. 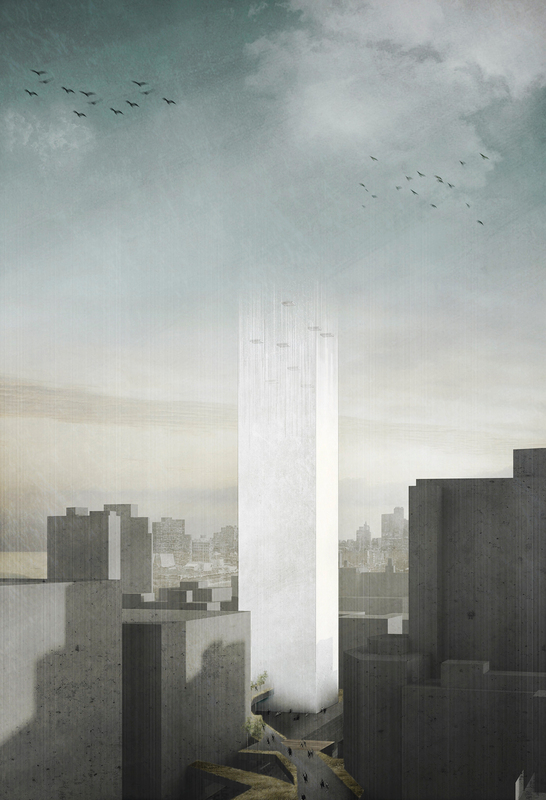 It is reconsideration of the cemetery but also of the skyscraper and its capacities by magnetizing its spaces. Death is inseparable aspect of our life. Cemeteries are usually located very close to us, occupied a lot of valuable land within city center which can be returned to citizens as a new, vibrant public space. However, it is very important to take care of our history and personal experiences, and share them with other people. Nowadays people tend to forget about importance of achievements done by our ancestors. Constantly changing world needs a new kind of medium to immortalize people’s cultural impact on society. The following is a proposal of new unique form of cemetery, not as a burial ground but infinite archive of memories and civilization milestones. 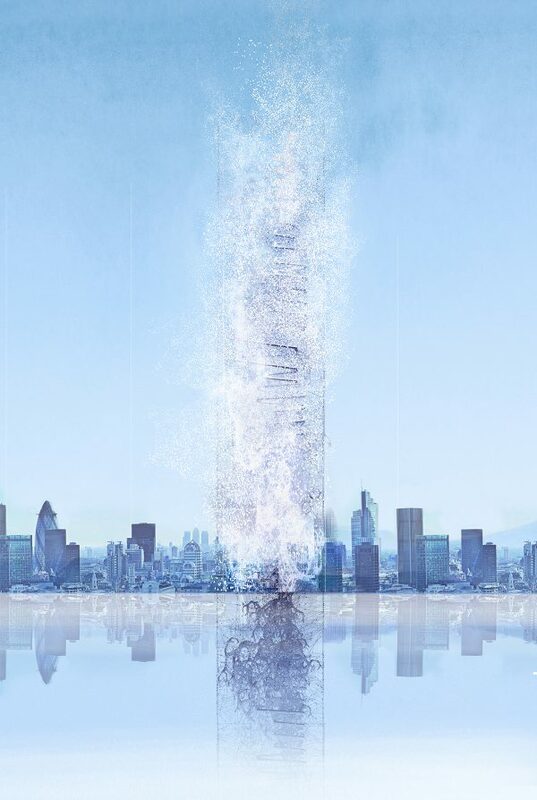 Cloud like structure of the building is filled with diamond data storage particles made from ashes of the dead. The data cubes contain their speeches and messages to future generations. It provides a unique opportunity of reviving memories of other people, and proves that everyone has a moralizing story to tell. Rapidly growing and constantly changing, chaotic world also needs a solution oriented towards creation of protected archive to preserve world heritage and achievements of world’s brightest minds. Over the centuries many cultural relicts, works of art and manuscripts has been destroyed in social and economical conflicts. The Cloud in its diamond-based memory, also stores this type of data in a form of brightest people’s memories that can be presented by using holographic projections. Instead of creating depressing, silence empty space, the complex works as a learning facility and a monument of all humanity. Building acts as a modern type of memorial tree that can survive harsh environment and natural disasters, because of its structural integrity. Its shape forms a sculptural timeline spanned across full height that represents current condition of the society. Thicker branches are sign of natural cataclysm, war or epidemic, thinner ones represent a peaceful time. Traditional methods of data storage are very fragile and have live expectancy between 10- 30 years. Books, photography and films are also very vulnerable to external factors. Human body contains 23% of carbon, which can be transformed to diamonds by applying pressure and high temperature. Recent studies lead by Siddharth Dhomkar, a physicist at the City College of New York demonstrate the possibility of using diamond as a platform for the super dense optical data storage by creating imperfections in their atomic structure. By forming a system that can survive couple thousand years intact, the common conception of ‘ashes to ashes, dust to dust’ is denied. The Cloud is a monument of people immortalization. After entering the complex, the body is transported to underground part of the building where the cremation process takes place. After cremation carbon is separated from the ashes. Next step is heating amorphous carbon to temperature of 2500°C to create graphite. Then the temperature is lowered to 1480°C and 5.99843885 × 10^9 Pascals of pressure is applied. After the process, the data is put into diamonds by creating laser engraved, sorted imperfections in its structure. After the process is completed fresh “Archiving Cells” are placed into selected Memories Cluster and become an integral part of the building. To provide self-sufficiency, the building is powered by geothermal power plant located in lowest part of the building. The Cloud is also reducing a carbon footprint of our society by converting excess CO2 into diamond composite which is used to reinforce the main structure of the building. London’s skyline can be thought of as a collage city – where the unique individuality of each tower prevents it from engaging with the urban scale of its surroundings. This divergent urban order is neither unique to London nor a condition that will diminish without careful and direct intervention. 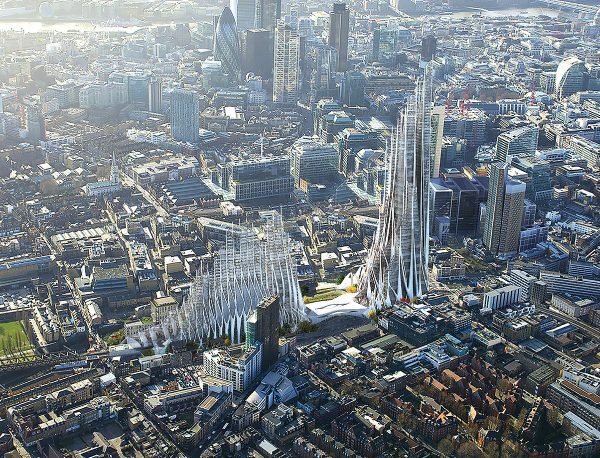 Our project seeks to address this collage condition by creating a complex that is at once individual and collective as a field of pencil towers blending seamlessly between one another – creating a new and iconic urban order as an archetype for London’s continued growth. Bishopsgate Goodsyard is the largest remaining undeveloped piece of land in central London, however it is not vacant. Currently occupied by a massive brick viaduct and bisected by an Overground rail-line, the Bishopsgate Goodsyard is a unique opportunity for density and diversity to redefine the conventions of the typical skyscraper while addressing the distinct character of the site. The project is organized into four main components: a high-density tower, a mid-rise neighborhood, a train station that bridges between the two, and a park landscape that mediates between the existing viaduct and the various access points throughout the site. Each of the four components are given their own unique character, and by blending them into a continuous field they produce a differentiated system that accommodates diverse and overlapping programs at a hyper dense urban scale. This project decentralizes the typically bulky tower core into finer perimeter elements. By rearranging the crucial tower components to the exterior – structure, elevators, stairs, and mechanical systems – the tower facade is instead articulated by the elements that are so often hidden away, creating a distinct appearance from street level and against the urban skyline. Early material studies focused on bifurcation and “bundling” techniques to visualize complex mathematical formulas, exploring potential moments of density versus open and loose strands that suggested larger voids or spaces. The concentrated “bundling” of towers allows for a closer proximity between each high-rise while maintaining significant views, light, and air. 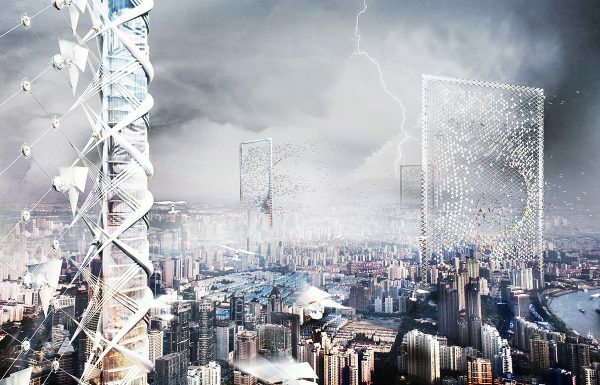 These towers converge and diverge – floor plates connect and split apart – addressing the diversity of uses occurring within the tower through scalar shifts in the available area ¬– from residential units to hotel units, corporate offices to start-ups, large retail stores to quiet cafés. This layering of buildings and programs causes the silhouette of the project to change from every perspective – its appearance is never the same from any two angles in the city – it is curious, ethereal, and poised. Manhattan is the most densely populated district of New York, where there are massive towering skyscrapers. Although the skyscraper is the hallmark of the modern metropolis, it’s necessary to pay attention to the existing problem when we concern the superiority of skyscrapers at the same time. However, skyscrapers in saving the land are not absolutely, and it is actually have very high requirements on the surrounding environment, such as road traffic, virescence, parking, etc. The higher the building is, the more the need for the surrounding facilities and open areas. For the whole city, the density of dense high-rise buildings can not only bring inconvenience to people’s lives, but also make people feel depressed, and it’s not conducive to people’s physical and mental health. In order to solve the problems such as the narrow space of the city, the traffic congestion and so on, we upgrade the ground, dividing the urban space into two independent parallel spaces. Ultimately, the parallel Manhattan born. Each person, or everything, will produce different results in different spaces, but the time in this space is the same as that of the original urban space. The new urban space is created in the parallel space, which is characterized by diversified functions and diversified forms, which is suitable for the diversity of different needs, and provides users with many choices. All kinds of public spaces carry various functions such as transportation, communication, rest, walking, watching, fitness, entertainment, catering, presentation, education, celebration and other functions. A variety of people, a variety of activities, a variety of events and a variety of stories converge to generate the vitality of the place, which is the charm of parallel space. The residents and foreign tourists who are desirous to read the city, experience the city will choose to enter the parallel universe to enjoy the life, enjoy the happiness. Parallel space has become the source of city environment, the essence of multi-culture carrier and the unique charm of the existing building, also the intensive high-level problem of skyscrapers has been solved. In view of the height of skyscrapers in Manhattan, we set up the parallel space above the ground 120m. Taking into account the lighting of the lower space, we choose glass as the main structural material. In a variety of building materials, due to the property of glass——reflective and transparent, the glass is not blocked from the original facade of the buildings. In terms of visual and spatial principles, existing buildings will not be weakened, and with light and movement of people, the whole space is endowed with vitality .For the structure, the shape of Pyramid, aspect ratio is 4:3, and majority hemline is 16m, minority 36m, in order to distinguish different space size. The netted steel not only plays the role of supporting and carrying, but also endows the glass with a kind of strength and beauty. Pyramid belongs to the ancient Egyptian where there are expansive. By using modern material to write the most ancient symbols, new glass Pyramid and Manhattan skyscrapers become into entirety. 2018 Skyscraper Competition is open for registration.